This pizza sauce is a true opposite to my super speedy go-to American pizza house recipe. It’s deeply rich with tomato flavor from cooking on the stove for an hour, with lots of small soft tomato chunks for texture. It works particularly well with many Italian style pies, or as a topping for deep dish Chicago pizzas. 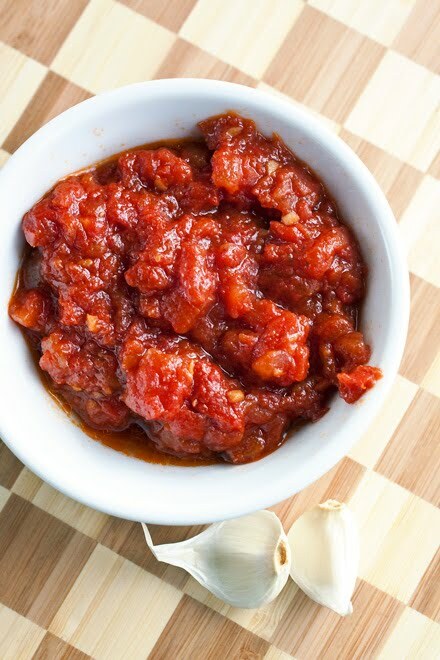 Although easy and inexpensive, this sauce cooks for a full hour on the stove. Make sure you plan ahead. 1. In a medium size saucepan, heat the oil over medium-high heat and sauté the garlic for about 1 minute, or until fragrant. Add the tomatoes with their juice, salt, sugar and some freshly cracked black pepper. 2. Bring sauce to a simmer and cook uncovered over medium to medium-low. Stir occasionally and simmer until all juices have evaporated, the tomatoes have broken up and the sauce thickens. About 1 hour. During the last 10 minutes of cooking time, break the tomatoes up with a wooden spoon. Optional: For a smooth sauce, skip breaking up the tomatoes. At the end of cooking time puree the sauce with a food processor or food mill. I love how minimalist this recipe is. Makes that 1 hour of cooking totally worth it. Wonderful sauce, I love how chunky and hearty it looks! Hi Laura, this looks great!! May give it a try, maybe I won't mess it up! Sorry I haven't commented in awhile, been MIA from blogland...I'm back now! Have a great evening Your photos are always beautiful! Simple ingredients and so much flavour. Love it Laura - the colour is calling my name! What a gorgeous sauce! The simpler, the better I say! This would be wonderful on fresh cooked pasta or a grilled pizza! Great looking sauce, that sounds like it will bring out the tomato flavor nicely! Looks so good. I always make my own pizzas and I never thought to try and make my own sauce. So perfect. I love home made sauces! Some fresh herbs would really blow this out of the water! Thank you for the recipe, always on the look out for changes to my pizza recipe to test! This is my kind of tomato sauce, delicious and easy to make. I love the chunky style sauce. Another good one, Laura! I need to try this soon. I've been dying for pizza so maybe I'll make this to put on a pita pizza!